The benefit of a narrow aisle pallet racking system is that it allows fork lift trucks to operate in aisles that are half the width required in conventional adjustable pallet racking. Link 51’s narrow aisle XL pallet racking utilises the available floor space and maximises the available storage capacity of the warehouse. Link 51 narrow aisle racking makes use of special narrow aisle lift trucks, as the precision designed storage system offers efficient loading capability despite the limitations of a narrow aisle. 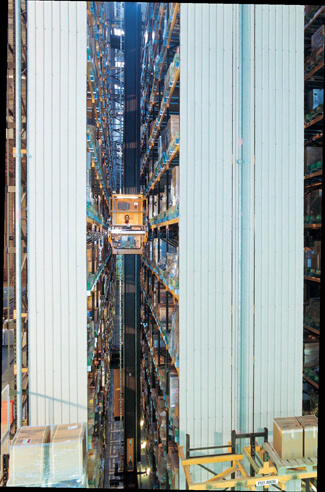 Fitted with guide rails or wires the lift trucks are guided down the aisles precisely, minimising the risk of damage to the racking whilst increasing safety within the warehouse. With Narrow Aisle racking in place it also makes it easier to manage the speed of operation and the accuracy of pallet handling. With Link 51 Very Narrow Aisle pallet racking you really get the ultimate in warehouse storage efficiency. 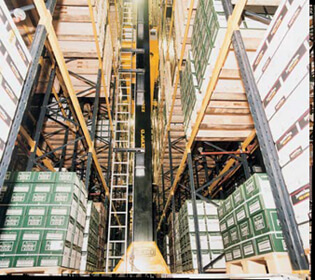 With aisles reduced to an absolute minimum and pallets stored up to 30m in the air you’ll get the most efficient pallet racking solution in terms of space utilisation. Order picking cranes provide fast access to pallets in an integrated warehouse operation. Pallets are put away and retrieved with unbeatable speed and efficiency. 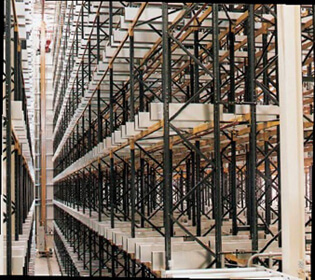 BSE UK can provide Link 51 Very Narrow Aisle racking as a solution to any suitable warehouse operation. The structural integrity of the very narrow aisle system coupled with the expertise and know-how of the BSE design team guarantees excellence in terms of both the product and the service provided.